Checkout this great trial deal! 2 Weeks for MamaBreak readers! 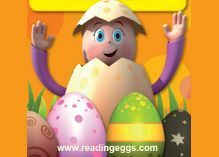 Reading eggs were developed by teachers and educators for kiddos age 3-12. Top developers and designers help your reader learn how to read! Since launching in the United States and Canada in 2011, Reading Eggs has signed on more than 500,000 subscribers and presented more than 15 million lessons in North America. Join the FUN today!